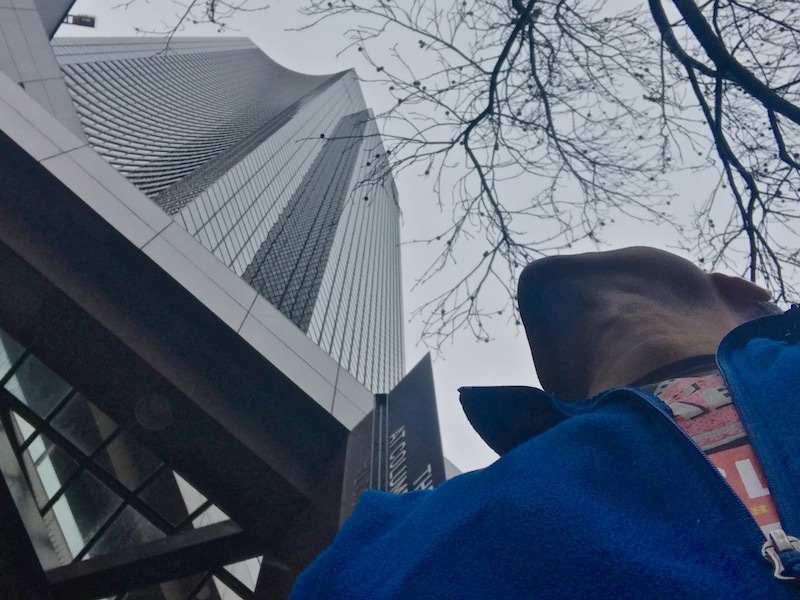 I Raced Up The Tallest Building in Seattle! (Big Climb Race Recap) | Keep It Up, David! 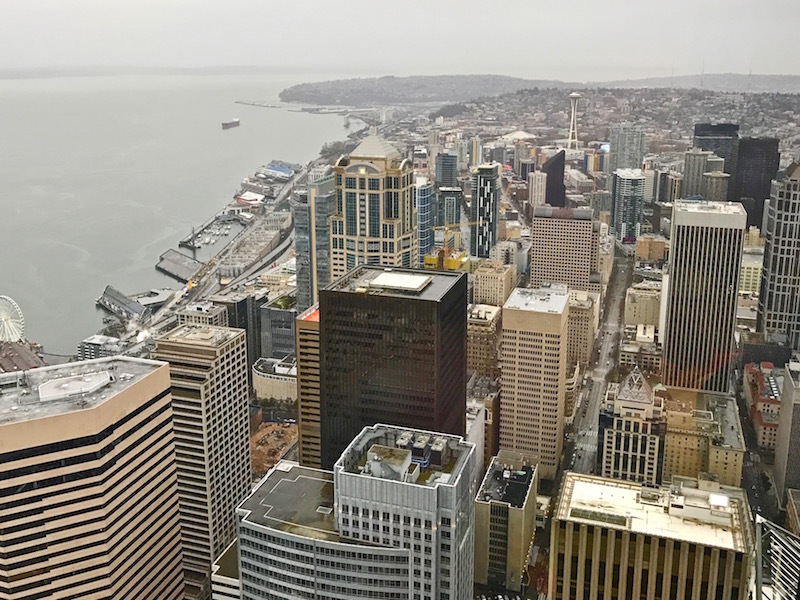 It’s a common misconception that the Space Needle, Seattle’s most iconic landmark, is also the tallest thing in town, but that’s not the case, no sir. 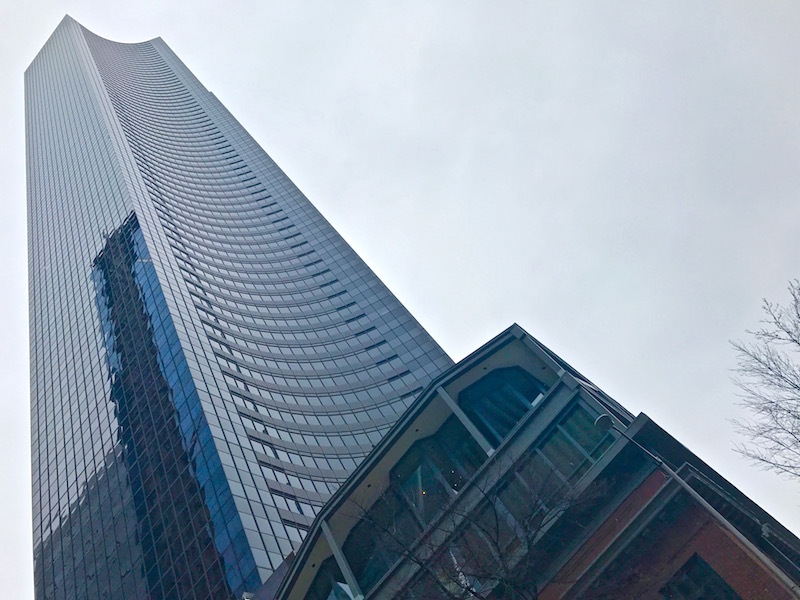 There are actually six skyscrapers that are taller, with the tallest, Columbia Center, reaching over 300 feet higher than the Space Needle. One big reason was the building itself. 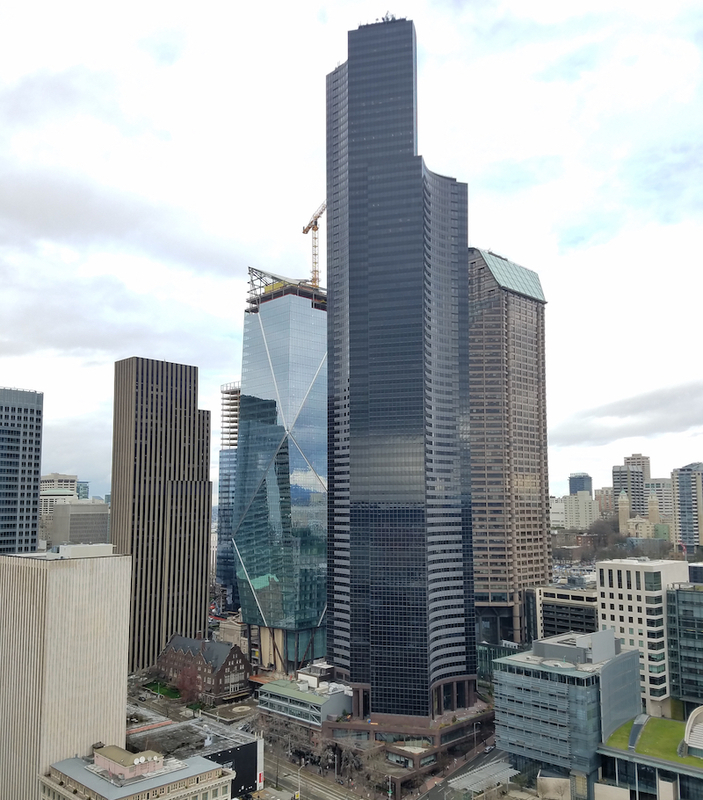 With a height of 937 feet, it’s the tallest building in Washington, and the third-tallest west of the Mississippi. I like racing in landmark, record-holding buildings, and this one certainly qualifies. The second reason was the actual race. 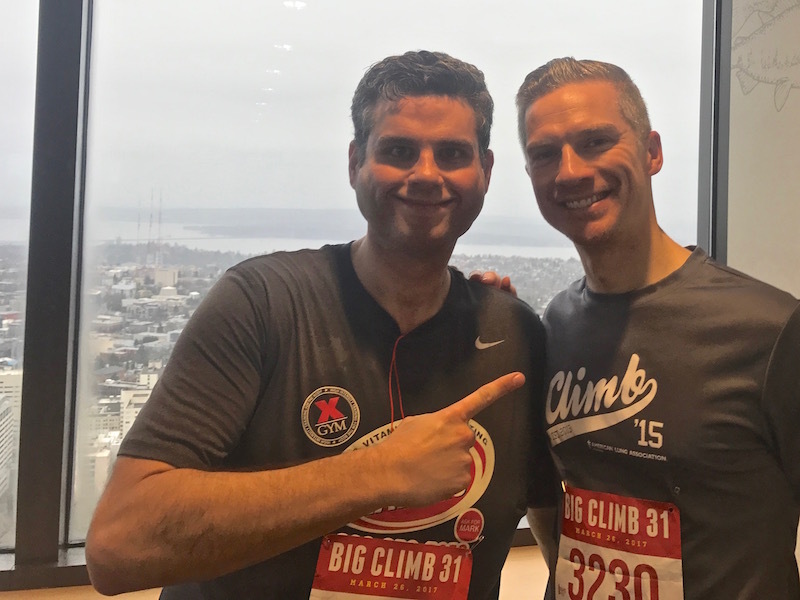 Big Climb Seattle, organized by the Leukemia and Lymphoma Society, is the largest, most popular stair race in the country. They cap registration at 6,000 people, and it sells out every year, often within 8 or 10 hours. It raises almost $3 million to help cure cancers. So, yea, this race is a big deal. And I finally got to participate! I arrived in Seattle excited for this experience, but man, was I nervous. I’d heard from a number of stair racing friends that this stairwell was tough. It has a reputation for being especially challenging. One good friend refuses to race here anymore. That reputation intimidated me, but how much worse can it be than any other stairwell? All stairwells are tough, because racing up stairs is no easy feat. It’s a grueling sport to begin with, so am I going to let a reputation for difficulty scare me further? In theory, HELL NO! In actual life? Yea, maybe a little. I had plenty of time to mentally prepare. 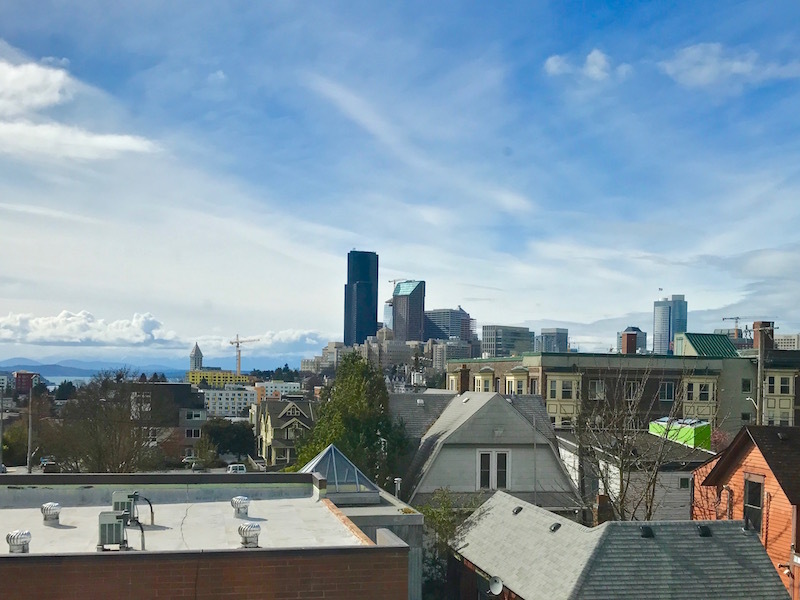 I stayed with my friends Collin and Blayne in Seattle, and they had a great view of Columbia Center from their kitchen window. From that distance, it looks like a regular ol’ skyscraper. Every city has them. No big whoop, I can climb that! From up close, though, it’s more intimidating. I was racing in the first wave of the day, at 8:30am, so there was no time to waste dwelling on what was ahead of me. I stretched and warmed up my legs, and got in line. 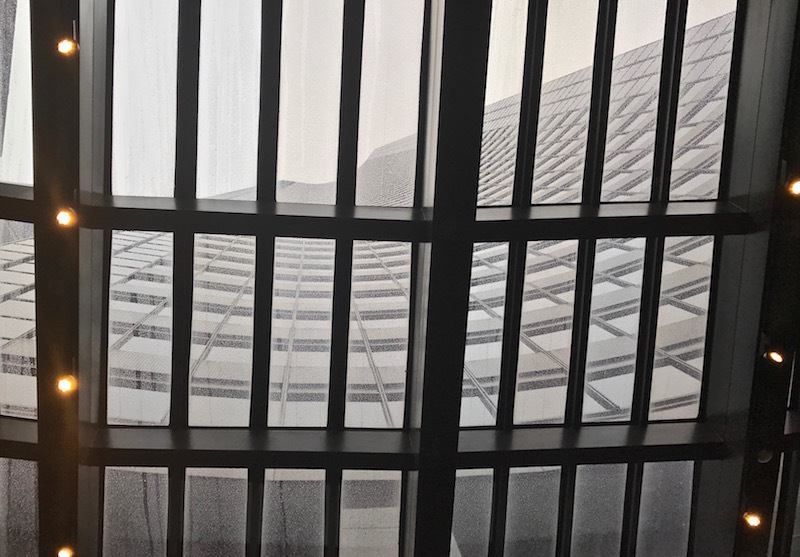 Columbia Center has a three-story atrium space filled with restaurants and stores. The race actually began on the 4th floor and ended at the 73rd floor, for a total climb of 69 stories. The event was very well organized. We lined up on the first floor, and when it was time to head to the stairwell, we headed up the escalators to the fourth floor starting line. The fourth floor offered one final view of the race course, through the skylights in the ceiling. One final time for me to gulp before prepping my watch and iPod. 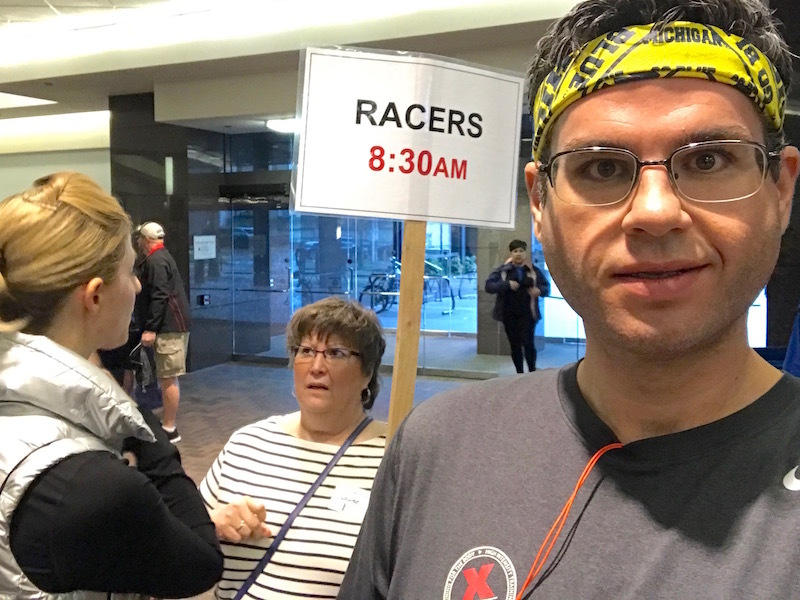 They let one racer enter every 10 seconds, and when it was my turn, I repeated my strategy over and over again in my head: start off slow… start off slow… start off slow… I have a habit of going out too strong during races, and exhausting myself way too early, and I didn’t want that to happen this time. 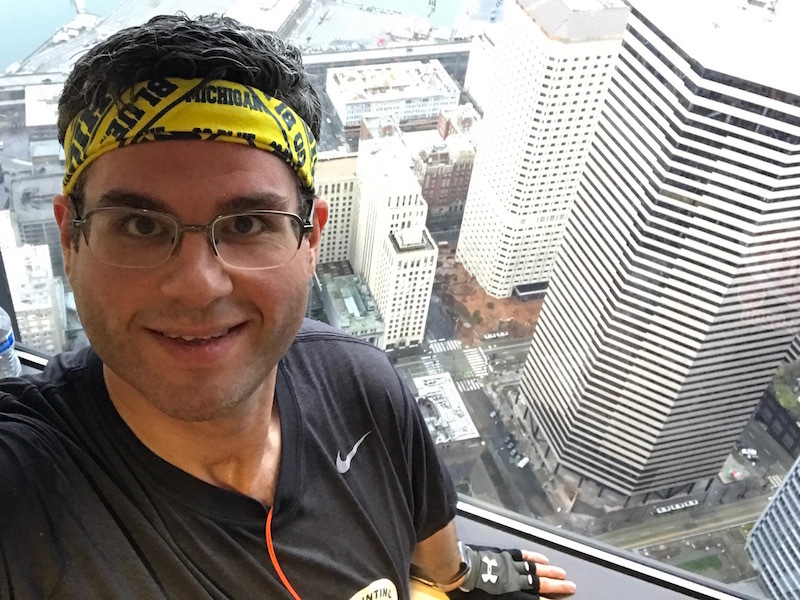 RELATED: Check out recaps from my other Seattle races in the Space Needle and Rainier Tower! The stairwell was remarkably narrow, which I like, because I don’t get claustrophobic, and I can easily use both handrails, but it makes passing more challenging. 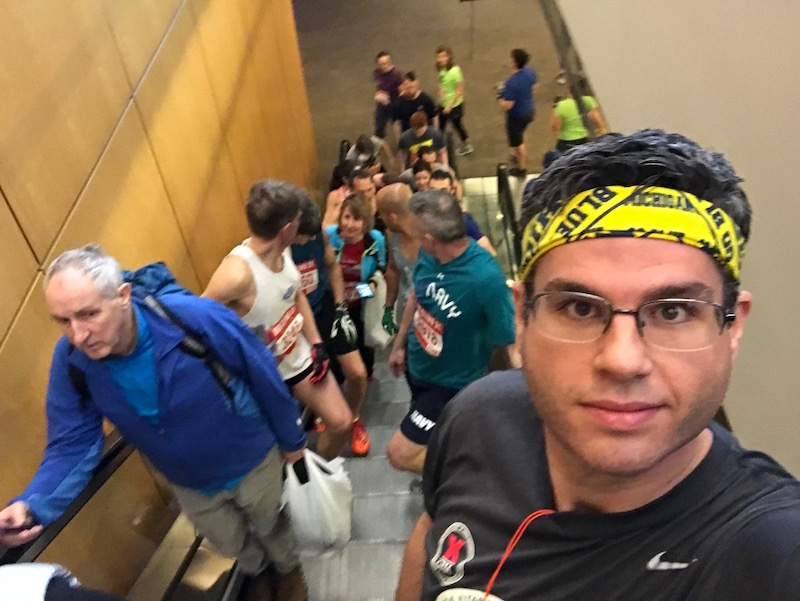 Luckily, that wasn’t a huge issue, as I only saw three other racers in the stairwell the entire climb: I passed one guy, and two people, a man and a woman, passed me. The guy that passed me was young, possibly a teenager, and remarkably fit – he had hardly broken a sweat, was breathing normally, and literally had one hand in his pocket. By comparison, I was sweating buckets and pulling in air as fast as I possibly could. I try not to notice floor numbers during these races, but that’s easier said than done. During this race, though, I managed to make it to floor 25 before noticing any of the signs, and it was a pleasant surprise when I realized I had already climbed higher than I thought. About halfway up, I thought about the reputation this stairwell had, but it sure didn’t seem any tougher to me. By that point, my quads, glutes and calves were burning, my heart was pounding out of my chest, and sweat was pouring down my face. But I was working hard, double-stepping, pivoting, and using the handrails like I know how to do, and getting the job done. It was difficult, but that’s what I signed up for! I had to remind myself, a couple times, that the race ended on the 73rd floor. 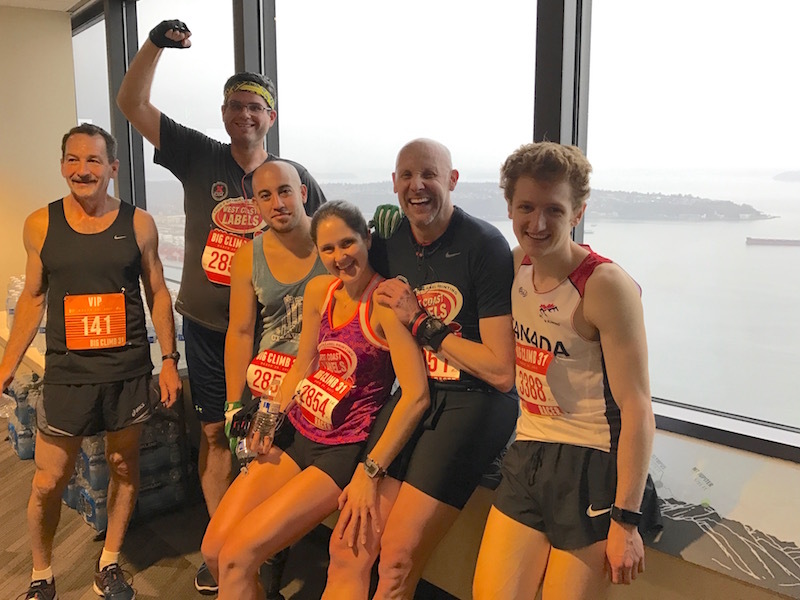 It’s easy to think that a 69-floor race would end on the 69th floor, especially when oxygen deprivation and fatigue start mucking up your thoughts, but that wasn’t the case in this building. 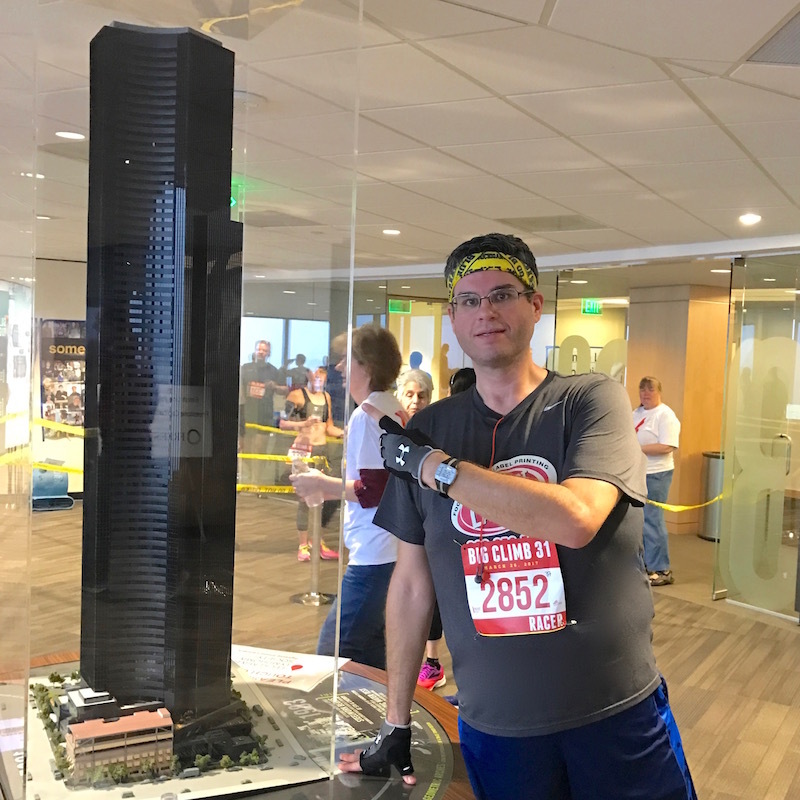 I tried to start an end-of-race sprint on the 68th floor. By that point, I was so depleted that it was more mental than physical, but my mental game is just as important as the physical components, and I relished counting down the final few floors and trying, trying, trying to put more into it. They live-streamed the finish line, and my friend Dan found the footage of me coming out of the stairwell. I posted the 7-second clip on Instagram. After being handed a bottle of water, I found an empty section of wall, collapsed against it, and slid all the way down, until I was lying on the floor. I later found out my average heart rate during the climb was 169, and I maxed out at 186, which ties my highest-recorded heart rate ever. RELATED: Enjoying this race recap? Check out recaps from ALL my races! After a few minutes of recovery, I staggered to my feet, on wobbly, achy legs. The view from up there was incredible. You know you’re up high when the Space Needle looks minuscule! I love a selfie with a view! I chatted with friends that had climbed: Howard, Alberto, Juliana, Dan and Shaun. Most of these folks I’ve known for a few years, but I met Shaun today. He’s a very nice guy and, oh yea, the fastest tower runner in Canada. And, just in case you didn’t know where you were, they had on display a model of the building we had just climbed. It’s a tall building in person, and a tall building at a fraction of the scale! It didn’t take long before they had results on the website. I climbed 69 stories (1,357 steps) in 13 minutes, 37 seconds! That’s an awesome time that I’m very proud of. I didn’t arrive with a specific time goal, but based on other climbs in comparable buildings, I thought I might finish in the 14-15 minute range. Nope, I did better! I finished 540th out of 1,380 men, and 159th out of 370 men aged 30-39. My average pace was 12 seconds per floor! Sounds like a great morning, right? Not yet – I wasn’t done yet! My friend Collin was racing in the 9:45 wave, so I broke the rules, cut off my timing chip, and climbed again, after him. I didn’t time myself. Collin zoomed ahead and I climbed at a casual pace. Two times up a 69-story stairwell equals 138 total stories – not too bad for one morning’s work! Plus, I got to enjoy the view with Collin. Just in case you haven’t been keeping diligent notes, Big Climb Seattle was the four stair race I’ve done in the past month! (The others were in Minneapolis, Chicago, and Springfield.) And guess what? There’s more to come! I’ve got two races coming up in April – races I haven’t even announced on here yet, and I’ll probably do two in June as well! Lots of gratitude to my sister Sarah, Dana, Joe and Joanne, and the Patrick/Peters family for their generous donations to the Leukemia and Lymphoma Society on my behalf. My donors are the best. No really. THE BEST! My sponsor, Bowflex, is the best as well. They very generously helped me cover my expenses for this race, and I am forever grateful for their continued support. I use my Bowflex products all the time – I have a Max Trainer and SelectTech dumbbells – and I can’t tell you how much I love using them. This entry was posted on Tuesday, March 28th, 2017 at 1:12 am and is filed under Uncategorized. You can follow any responses to this entry through the RSS 2.0 feed. You can leave a response, or trackback from your own site.